Since 2002 Thermalright has dominated the CPU cooling market and in 2006 they revolutionized VGA cooling with the the HR-03 series setting a new bar for VGA cooling performance. Today I will be looking at the HR-03 GTX which continues with the same high qaulity constructed components and cooling performance expectations that comes with HR-03 series name. Without further a do I present to you the Thermalright HR-03 GTX!!! Immediately you'll notice a dramatic change from the usual packaging from Thermalright, no longer are they using the traditional brown box with a plastic foam to protect the unit from damage during shipping. Despite that the unit is well packaged and showcases the product nicely, from front to back we see the cooler displayed and the features, technical specs, and most importantly compatibility clearly ledegable on the back. Out of the box the unit is incased in a robust black carboard with a foam top securing the card in place not allowing it to move with any ease. (Not Shown) The mounting components are neatly secured in the bottom of the packaging, by simply removing the cooler and pulling the inner bottom fold out, it reveals a compartment where you'll find your hardware and instructions to mount the HR-03 GTX. The assembly package contains all the components in small baggies with the numbers 2, 4 and 6 using the sheet you can idenitfy each baggie and its contents. Out of the package you are presented with numerous parts, albeit a bit daunghting for some Thermalright was sure to include a sheet that identifies each component with a corresponding number and pieces included. This greatly helps those that have just purchased their first HR-03 series cooler and might need a little more help identifying each part. On the back of the sheet shown are the installation instructions for the heatsink and the fan, a very straight forward 8 step process for anyone with or without experience can easily understand. Now lets get on with the cooler and the installation. Here we have the HR-03 GTX primary heatsink in all its nickelplated goodness by comparison not much has changed compared to the HR-03 GT. Based upon my comparison and technical specifications from Thermalright the HR-03 GTX cooler is just a touch deeper at 133m compared to 129mm, 156mm wide compared to 155.93mm, and the only real difference is the height of the cooler at just a mere 38mm tall without fan compare to 55mm of the HR-03GT. Overall the weight has gone unchanged at 410g and features six copper nickel plated heat pipes. The base of the heatsink by my inspection deserves some mention, despite it not being completely smooth and the feel of slight grooves from machining is present its the best surface I have seen from Thermalright to date. From the pic you can see that it is reflective in nature and from my inspection was completely flat, I have complete confidence that it will ensure excellent even contact with the IHS (integrated heatsink) of the GTX 260 and 280. On with the installation!! The installation was a breeze following the provided instructions from Thermalright I had no troubles at all. The most important part of the installation is that all memory ICs need to be completely clean or your memory-sinks will not stick and likely fall off. Thats why I recommend using 99% Alcohol. Thermalright claims that if all ICs are cleaned correctly the memory-sinks will hold the complete weight of the card on its own. For consistency and because the balance of users here at HWC use MX2 it only seemed right to use it in this review. At a later date I will be conducting another review which will include 2 other thermal interface materials from Innovation Cooling and Coolit System, so please look forward to updated results in the coming weeks. Now lets get on with what we've all been waiting for, the test results!! A quick system shot of the unit installed, what a hog!! Takes up 3 slots no SLI this time around. Testing methodology: My test results will be conducted in 2 stages one with the side panel of my Antec P182 off and two with the side panel on. I felt this best because it will show you the maximum performance achieved through good airflow and what I call ideal conditions. Having the side panel on will demonstrate the limitations of my case, the importance of good airflow, and the overall affect on the rest of the system. All my results are by no means scientifically accurrate and I ask that you use my results as nothing more than a guide and do not represent results that you might acheive if similiarly tested. After 30 pretty gruelling minutes of Folding its pretty apparent in an open case the HR-03 GTX preformed pretty admirably reducing idle temps by up 20oC and load temps by 13oC quite a difference considering it was all done in near silent operation. I ran this test longer than originally planned because I wasn't sure of the results, but no matter what the the HR-03 GTX wouldn't go past 64oC. There's little to say about the stock cooling to maintain this temp in closed case environment I had to crank the fanspeed up to about 91%, its likely due to my higher than normal ambient temperatures the GTX 280 sure was cooking during the entire test. Well its apparent despite the overall advantages of the HR-03 GTX it does have one weakness and all that hotair and heat eminating from it has only one place to go but up. As you see from the chart the unit does heat up the Antec P182 considerably pushing my CPU temp up about 10oC from stock. The only solution here is more airflow, unfortunately its something the P182 is a little lacking in. I had high expectations for this cooler coming from a series that has produced great results time after time. Despite some minor weakness depending on how you look at the cooler does not move air outside the case like the stock cooler does, however a case with adequate airflow designed to handle the likes of the GTX280/260 the results could of have been much different. It's also an extremely large unit taking up 3 slots with a fan attached making SLI not an option with the GTX280/GTX260, although possible if mounted on the back of the gpu. In my opinion the HR-03 GTX has proven an admiral piece of cooling hardware, cooling any GTX 280/260 is no easy feat and Thermalright has clear winner here. Paired with the right fan the Thermalright can not only cool your GTX280/260, but it can do it in almost complete silence. With that the Thermalright HR-03 GTX gets my seal of approval and comes highly recommended. Please feel to post any comments and thanks for reading. Is it possible with this HR to reverse-mount the HS? Ive seen pics online that you can mount it so the fins are on the back side of the card, thus making the HS actually contact the card on the 'back' of the block...I hope you know what I mean. Basically the Fins would be up towards your CPU, instead of down towards the bottom of the case. Yes I have also seen reviews of the unit with the heatsink mounted towards the back of the videocard. I will attempt this myself and post pics, from my understanding it acutally has been said to improve cooling. Look forward to updates to the review as I compile more data from other sources. Due to time constraints and my desire to post the review as soon as possible I went with what current information I already had on hand. I guess putting two of these into a raven is impossible right? Great review. Very well written with great photos. Keep up the good work, Eagle Eye!!! I've seen three other reviews from various sites on the HR03-GTX. None of them have been as straightforward and to the point as Eagle Eye's review. Excellent photos too. My experience with this cooler has been much the same, it does it's job well. 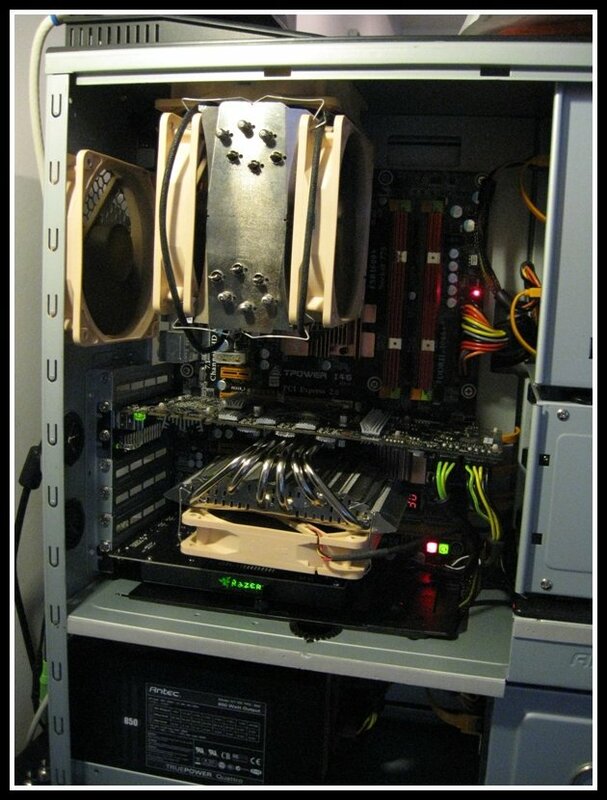 As you have said, there are many variables, such as the case airflow, which can influence cpu temperature. For me, the airflow in the Antec 902 has been enough to sufficiently exhaust the heat buildup from the cooler itself so it has no negative effect on my cpu temps. Superb review, and looking forward to more testing results. Last edited by Retro; March 30, 2009 at 09:56 PM. Does it fit on the 55nm GTX 260's? or just the 65nm? And how many poo fans do you have, you poo fan fanatic you? Edit: Very nice work on the review, BTW. Thanks phil, beat me too it. Sugar its look like a simple addition of some VRM heatsinks since the 285 and 260 55NM differ in layout from the previous version. Oh and the Poo fan total comes to 7 at the present time, honestly if I could fit more I'd have them in. It might be worth a try, if you're up to the challenge. I think with the right fan choice and installation method it could work. It was quite amazing to watch how things heated up when I had the side panel on, after 45 minutes or so nothing but hot air was being pushed around the cpu heatsink. Last edited by Eagle Eye; March 30, 2009 at 10:18 PM. I've just installed the HR-03 GTX on my Point of View GTX 280. I was so boring of the original fan @100% every time I played, which result was an amazing sound. I've installed the same noctua's fan (NF-P12). I would like to know which rpm you have chosen ? Did you keep the 12V adaptator for 1300rpm ? Another question : is it possible to connect the fan to the graphic card, as was the original fan of the graphic card ? In order to take benefits from the regulated speed of the fan, controled by the graphic card. PS : At my first installation, I just set the fan in the wrong direction (must have been hypnotised by the Noctua's logo :D). Idle T° was 40°c (very good, before I had 55-60°c), but when I launched a GPU stress test with OCCT, my graphic card just crashed after 1 minute. I've just seen the last remoted T° : 80°c and it was increasing very quicky. I did and its important that the fan be running at full RPM all the time. I choose 1300RPM, while slower than ThermalRight's recommendation the Noctua NF-P12 is a very capable fan and in my opinion an ideal choice for this cooler if you want a good balance between noise and cooling. Unfortunately you cannot connect the fan to regulate the fanspeed. Direction of airflow is important and in such cases mistakes can be made, with the fan in the right direction you your load temps should not exceed 65oC in most cases while gaming. Applications like folding@Home GPU and Furmark stress videocards beyond normal operating conditions you will see your temperatures rise considerably. As I stated in my review factors such as case design and airflow are the major performance factors effecting the HR-03GTX, so keep that in mind.